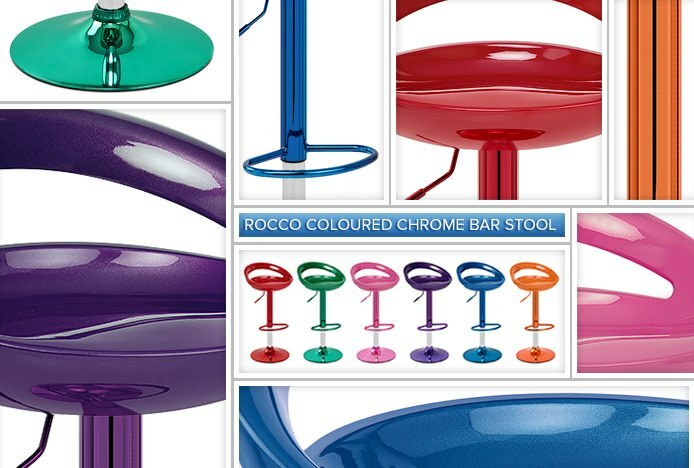 Brand new for February 2014, we are delighted to announce our exciting range of coloured chrome bar stool designs. 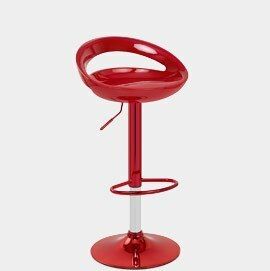 Guaranteed to instantly reinvent the look of your bar area, coloured chrome offers a completely unique twist on the metalwork of traditional gas lift bar stools. An industry first, it effectively provides you with the opportunity to match the colour of your seat with that of the chrome featured on the round base, footrest and the top column of the stem. Catching the eye from all angles, it will consequently supply any location with a remarkably flawless effect. To introduce this metalwork finish, we are releasing the gorgeous Rocco Bar Stool range. Composed of ABS plastic with a stylish high gloss finish, the Rocco is available in a spectrum of beautifully bold colours including purple, green, pink, blue, red and orange. Vivid and memorable, each of these coloured designs is guaranteed to give your bar a distinguished splash of colour, whether its within your home or business. Perhaps you could catch customers' eyes by employing orange designs in a funky juice bar, or fully embrace girly glamour in a nail bar with head to toe pink bar stools. What's more, as the coloured metalwork is such a striking and individual feature, it will really make a statement in neutral or minimalist rooms within your home, as well as those which have similarly daring decor. With such extensive possibilities, stylishly reflective coloured chrome has effortless versatility and unforgettable appeal. Comfortably moulding to the body, the Rocco also provides a modern twist on the popular crescent seat design with constant relaxation and support being supplied through the inclusion of a low, sweeping backrest. The addition of a gas lift mechanism within the chrome stem also enables effective height adjustment and 360-degree swivel whilst seated. Inventive and entirely original, these incredible designs are exclusive to Atlantic Shopping and are sure to astound anyone who encounters them. (2015 - Please note, the Rocco has since been discontinued, however the Crescent Bar Stool is still available in a wide range of funky colours.